In front of the Caroni’s entrance, he discovers padlocked doors, an abandoned site covered in vegetation, even the name of the distillery was barely legible on the front house. "An apocalyptic scene" for his memory. The Italian liquor importer later learns of the government's decision to close the sugar factory in 2003, out of molasses to distil the rum, the distillery closed the following months. Moving forward, Luca Gargano, visited a winery with Jim Moore, in charge of the purchasing, where they discovered several hundred barrels, the oldest of which dates back to the 1970s, this discovery surpassed their wildest dreams. Between 2005 and 2011, the Velier purchased barrels from the State of Trinidad and the company Angostura, leaving these barrels age in the region. They plan to market 25 special editions during this period, from a few thousand bottles on average to a few hundred for the most limited edition. The bottle is recognizable among all with its shape reminiscent of the Scotch bottles from the late nineteenth century and with distinct etiquettes depicting life scenes of the Caribbean in 2004. 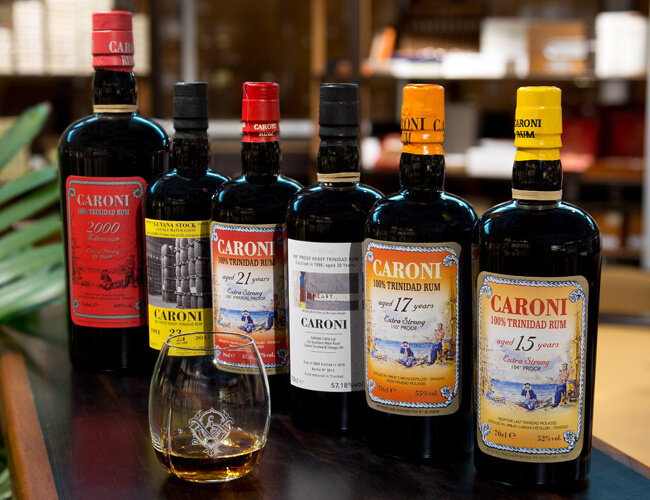 It was not until the distillery was closed that the Caroni rums were finally marketed under their own name. It is this power that he wished to magnify with "Cask Strength" bottlenecks around 62%, or slightly reduced between 50% and 55%. Caroni thus retains its peculiar characteristics, dominated by tar and oil at first, progressively evolving with notes of spices, vanilla, chocolate, roasting and flowers. They have an unusual aromatic profile which is mainly due to the preservation of barrels in tropical climate, high heats combined with high humidity would completely change the evolution during the aging period. "Aging is accelerated in the Caribbean," says Luca Gargano. The angel’s share, liquid lost in evaporation, reaches on average of 10% per year, against 1 to 2% in Europe. An aging of 12 years in the West Indies corresponds to an equivalent of 35 years in Scotland! " Unfortunately, the Caroni distillery was destroyed in 2005 and its production will never resume and therefore these are the last bottles left.